When I was in college, I would stay with a cousin on the weekends while I worked in Lexington. My cousin frequented Sawyer’s Grill downtown and I would sometimes join her. That is where I met Stephen, who was working there as a bartender. Nine years later I made sure to get a picture of us with the Sawyer’s sign on our wedding day. I really enjoyed my astronomy classes in college, so it didn’t seem weird when Stephen asked me on a stargazing date. We snuck into a park after hours and laid out a blanket in the middle of a field to look for constellations. Stephen pulled out a ring box, asked me to marry him and I said yes right away. I kindly asked him to propose again, but this time on one knee, call me a traditionalist! We looked into a couple of places but nothing was catching my eye until I realized that Limestone Hall would be open right around the time of our wedding, so I jumped on the opportunity. Stephen has a history degree, so he appreciated the historical characteristics of the venue. 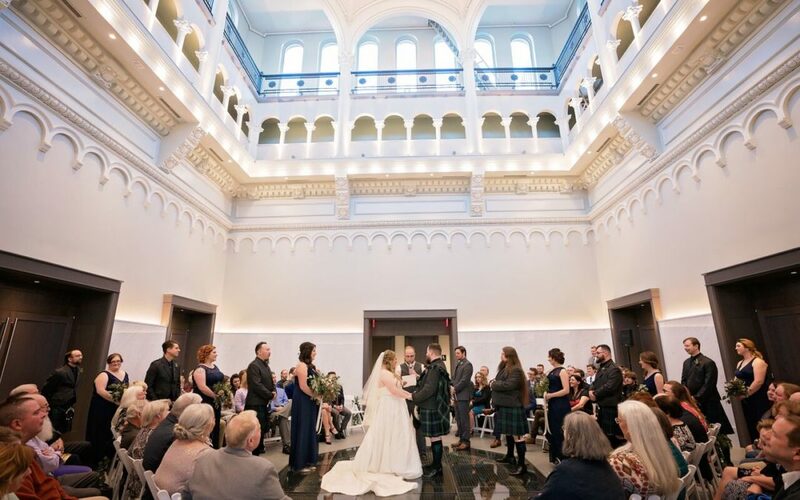 I loved having the venue and reception hall all in the same place, and we were the first wedding after the renovation. From the twinkle lights in the rotunda to the garden lights in the reception space, everything fit perfectly with the night sky/constellation theme. What elements were the most important for your wedding day to you? The most important thing for our wedding was for it to be true to us. The first thing I said to every vendor was that “I do not want any burlap, boots or barns.” We are true blue Kentuckians, but we are a part of the nerdier side of Kentucky. The men wore kilts, the guests sat in a circle around us and the bridesmaids and groomsmen sat in a circle around us. We also read a children’s book during the ceremony and played Star Trek: The Next Generation theme song as our walkout music. It was unlike any wedding we had ever been to and it was perfect for us. Hire a day of coordinator, because they are worth every penny! I am sure there were things that went wrong that day, but I was blissfully unaware. I had a relaxing day and married my best friend, not stressed was needed. I would also pick a good photographer and make sure it is one whose work you will love for years to come. Finally, get your DIYs done early because last minute details can really weigh you down. Help your future self out and get stuff done in advance! ©2016-2018 Bridal Bliss Magazine. All rights reserved.